Family 1 : Robert E. FINGER Jr.
Found her on the 1855 Clermont, Columbia, New York state census (img 13) as Nancy Rockefeller age 43. Found her on the 1870 Concord, Jackson, Michigan census (img 15) age 32, keeping house. Found him on the 1930 District 5, Knox, Tennessee census (dist 75 img 1) age 8. Jan. 4, 1959, Mrs. Theresa W. Finger of 74 Sutorius Dr. Surviving are five sons, William, Cleveland, Ohio., Carl, George, Henry, Louis, and Gustav Finger, two daughters, Mrs. Roy (Mary) Grube and Mrs. Maurice (Betty) Dickman; eight grandchildren, seventeen greatgrandchildren and several nieces and nephews. Found her on the 1905 Rochester, Monroe, New York state census (E.D.02 img 24) as Therese M. Finger age 26, housework. Found her on the 1910 Rochester Ward 19, Monroe, New York census (dist 188 img 23) as Teresa Finger age 42. Has given birth to 8 children, 8 are living. Found her on the 1920 Rochester Ward 19, Monroe, New York census (dist 221 img 3) as Theresa Finger age 50. Came to the U.S in 1888, naturalized in 1893. Found her on the 1930 Rochester, Monroe, New York census (dist 163 img 48) as Theresa Finger age 61. Found her on the 1940 Rochester, Monroe, New York census (dist 65-325 img 24) as Theresa Finger age 72, widow. Living with her is her son (listed as brother) George Finger age 48; and son Henry Finger (also listed as brother) age 47. Also listed in the household are a nephew Harry and niece Ruth. Found him on the 1930 Lincolnton, Lincoln, North Carolina census (dist 15 img 25) as Austin A. Chatman Jr. age 8 months. His obituary referred to him as Austin "June" Chapman Jr.
Found him on the 1920 Columbia Ward 4, Boone, Missouri census (dist 21 img 9) as Arthur C. Dahlberg age 24. Found him on the 1940 Geneva, Ontario New York census (dist 35-28 img 1) as Arthur C. Dahlbert age 45. Dairy chemist, research experimental station. Father, mother born Sweden. Found her on the 1930 Gastonia, Gaston, North Carolina census (dist 18 img 18) age 8. Found him on the 1920 Ironton, Lincoln, North Carolina census (dist 105 img 25) age 41, farmer. His widowed father, Lawson Dellinger age 90 is living in his household. Found her on the 1910 East Greenwich, Gloucester, New Jersey census (dist 119 img 1) as Anna E. Dersch age 6. Found her on the 1930 East Greenwich, Gloucester, New Jersey census (dist 5 img 18) as Anna E. Dersch age 26, single living at home. Found him on the 1856 Davenport, Scott, Iowa state census (img 105) as Bernard Finger age 1. 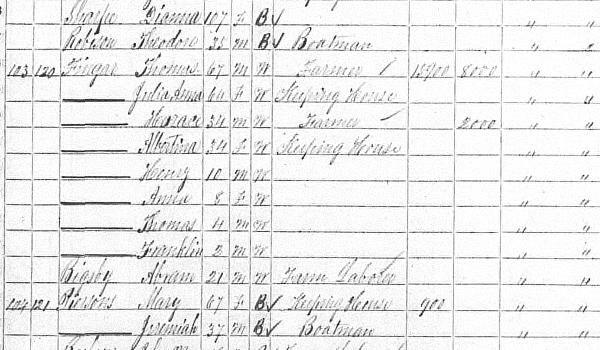 Found him on the 1860 Davenport, Scott, Iowa census (img 65) as Bernard Finger age 5. Found her on the 1870 Davenport Ward 1, Scott, Iowa census (img 56) as Bernhard Finger age 15. Found her on the 1900 Livingston, Columbia, New York census (dist 25 img 7) as Edith Fingar age 16. Found her on the 1910 Livingston, Columbia, New York census (dist 29 img 30) as Edythe. Found him on the 1900 Maple Creek, Outagamie, Wisconsin census (dist 91 img 8) age 15. Found him on the 1910 Mattison, Waupaca, Wisconsin census (dist 85 img 20) age 25, farmer. Found him on the 1920 Maple Creek, Outagamie, Wisconsin census (dist 221 img 4) age 34, farmer. He is living a few dwellings away from his uncle Julius Finger. Found him on the 1930 Maple Creek, Outagamie, Wisconsin census (dist 43 img 18) as Alvin Finger age 45, farmer. Found him on the 1940 Saugerties, Ulster, New York census (dist 56-71 img 27) as Robert Finger age 8. Found her on the 1880 Kingston, Ulster, New York census (dist 124 img 8) as Maggie Maud Harris age 2. Found him on the 1900 Cohocton, Steuben, New York census (dist 71 img 30) as William Hibbard age 18. He is living with his mother and step-father William Stone. Found her on the 1920 Lincolnton, Lincoln, North Carolina census (dist 108 img 25) as Louise Honeycutt age 4 years 2 months. Found her on the 1930 Lincolnton, Lincoln, North Carolina census (dist 14 img 4) as Louise E. Honeycutt age 14. Based on their ages, Susan and Sarah may be the same person. Susan in on the 1850 census only, age 8, while Sarah is on the 1860, 1870, and 1880 censuses age 18 and 28, and 38. Found her on the 1850 (not stated) Catawba, North Carolina census (img 38) as Susan Ikard age 8. Found her on the 1880 Campobello, Spartanburg, South Carolina census (dist 139 img 57) as Mary E. Johnson age 11, at school. Found him on the 1920 Saugerties, Ulster, New York census (dist 201 img 11) as Michael Kelly age 34, salesman, packing house. He and his wife Lilabel are living with her parents Daniel and Jane Finger. Found him and wife Lilabell on the 1930 Saugerties, Ulster, New York census (img 1) age 44. Father born Ireland, mother born New York. There are no children listed. Found her on the 1900 Gallatin, Columbia, New York census (dist 12 img 7) as Mina Kilmer age 14. At her home in the town of Clay, Saturday, September 20, 1919, Percilla, wife of George W. Green, aged 65 years, 6 months and 25 days. Funeral services were held at the Morgait church Tuesday at 1:30 p. m. Burial was made in Riverview cemetery. Besides her husband, she is survived by three sisters, Mrs. Fred Sahms, Mrs. Emma Stark and Mrs. Carrie Green, and four brothers, Edward, Henry, Fred and John Littleboy. Found her on the 1860 Clay, Onondaga, New York census (img 41) as Persilie Littleboy age 6. Found her on the 1870 Clay, Onondaga, New York census (img 74) as Percilla Littleboy age 16. Found her on the 1880 Clay, Onondaga, New York census (dist 166 img 9) as Percilla Littleboy age 26, living at home. Found her on the 1900 Lysander, Onondaga, New York census (dist 57 img 14) as Perciller Green age 46. His son Wallace's death certificate lists his name as Solan Lowery. Found him on the 1870 Antrim, Watonwan, Minnesota census (img 9) as Salon Lowry age 33, farmer. Living next to him is Laura Lowry age 76, born Vermont. Perhaps this is his mother. Found him on the 1940 Penn Yan, Yates, New York census (dist 62-2 img 2) as Richard Machuga age 6. Found him on the 1900 Justice Precinct 3, Parker, Texas census (dist 72 img 13) as Deny Melton age 1. Found him on the 1910 Justice Precinct 4, Parker, Texas census (dist 77 img 23) as Denney Melton age 11. Found him on the 1920 Garner, Parker, Texas census (dist 72 img 11) as Denney A. Melton age 21, single, living at home. Found her on the 1900 Civil District 10, Blount, Tennessee census (dist 21 img 15) as Lillian Rodgers age 10. Father: Daniel C. SCHWEHM Jr.
Emmanuel Evangelical Church was the scene Saturday at noon of the wedding of Miss Virginia M. Schwehm, daughter of Mr. and Mrs. Daniel Schwehm of 9 Queen Street, to R. Cole Fingar, of Penn Yan, brother of Mrs. Mark D. Chaiel of Rochester. The double ring service was read by the pastor, the Rev. Ernest Bittner. The matron of honor was Mrs. D. F. Delbridge. Best man for his brother was Richard T. Fingar. D. F. Delbridge and Vincent Verzaro ushered. A wedding breakfast was served in the Johnson City American Legion Clubhouse, after which guests were received in the Schwehm home. Found her on the 1930 Binghamton, Broome, New York census (dist 20 img 39) as Virginia Schwehm age 7. Found her on the 1850 Lehman, Pike, Pennsylvania census (img 10) as Catharine Finger age 47. Found her on the 1850 Abington, Wayne, Indiana census (img 20) age 75. Found her on the 1850 Copake, Columbia, New York census (img 37) age 28, living at home. Found her on the 1920 Rochester Ward 18, Monroe, New York census (Dist 211 img 5) as Leonara Finger age 25. Found her on the 1910 Chicago, Cook, Illinois census (dist 981 img 21) as Edna Wade age 2. Found her on the 1920 Chicago, Cook, Illinois census (dist 761 img 3) as Edna Wade age 12. RUSHVILLE - Final rites for Mrs. Bertha Watkins Wells, 89, widow of Weston W. Wells formerly of East Potter, will be at 11 a.m. Wednesday in the Hobart Funeral Chapel, Inc., Rushville. The Rev. Harvey Griffith, pastor of Gorham Methodist Church will officiate. Burial will be in the Voak Cemetery, East Potter. Friends may call at the chapel from 7 to 9 p.m. today. Mrs. Wells died Sunday in Wantagh, LI., where she has made her home with her daughter since shortly after the death of her husband in 1937. Born in England, the daughter of James Watkins, she came to this country at about 11 years of age. In 1900 she married Mr. Wells and their married life was lived to the Voak area. Survivors are a daughter, Mrs. Donald Gover of Wantage, L.I., and a son, Clayton, Santa Monica, Calif.; four grandchildren, Douglas Gover of Phelps, and David, Donald, and Caroline of Wantagh. Found her on the 1930 Potter, Yates, New York census (dist 16 img 8) as Bertha Wells age 57. Father, mother born England. Currently not married and living in Wasilla, Alaska. Found her on the 1850 Livingston, Columbia, New York census (img 30) as Albertina Weaver age 14. Found her on the 1860 Germantown, Columbia, New York census (img 19) as Albertina Fingar, age 24. She and her family are living with her husband's parents Thomas and Julia Fingar. Found her on the 1880 Clermont, Columbia, New York census (dist 8 img 7) as Alberttena Fingar age 43. Found her on the 1900 Clermont, Columbia, New York census (dist 10 img 3) as Albertina Fingar age 63, widower. Living with her are her son Frank Fingar age 32 and daughter Anna (Finger) Rockefeller age 37. She is living next door to her son Thomas. Has given birth to 4 children, 4 are living.